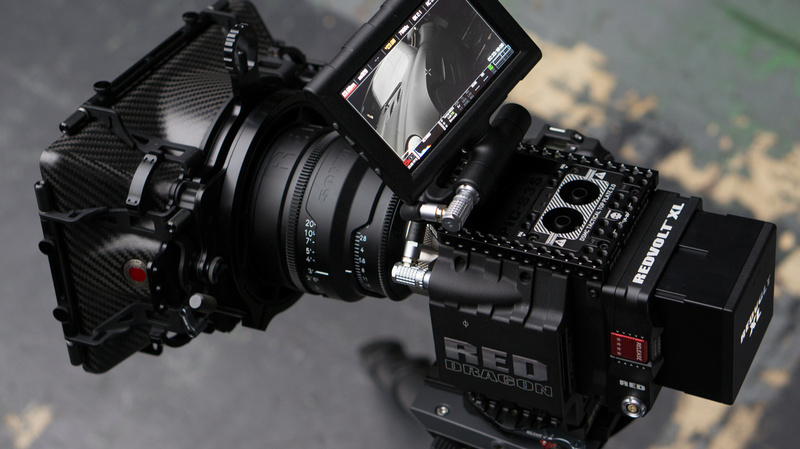 A lot is said about the feature films, but what about the little crews out there trying to make it big with something small?Movienomics realizes that there’s an economical impact on a filmmaker at all stages of their career and we hope you can take something from these posts and apply them to your own films. So get ready as we serve you a slice of the short & sweet in cinema from some of most talented filmmakers emerging in the industry. Welcome to the Movienomics.com Short Film Sundae! Grab your spoon and dig in as Movienomics.com takes you to the frontier of the US/Mexico border and gives you the scoop on the success behind ‘More Than One’/ ‘Mas De Uno’. There is a Latin explosion occurring throughout the industry and Movienomics.com is watching an emerging market that easily the general market does not understand. 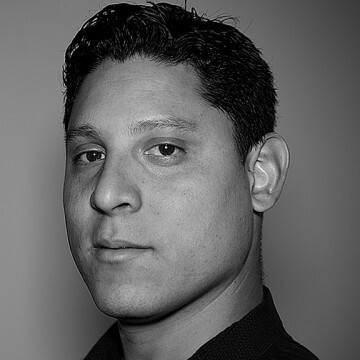 That’s why we’re proud to bring you some Latin flavor for this episode of Short Film Sundae – Venezuelan director, Jon Alex Herrera. His film, ‘More Than One’ / ‘Mas De Uno’, exemplifies on a pixel level of the megachasm that is Hollywood where the inspiration for human stories are. This tale is short, sweet, and should be on the radar. Taken from personal experiences living along the border city of Juarez, Texas, the film encapsulates what can happen when morals trespass any boundary or system that is placed. Stereotypes and themes of discrimination are explored through a Latin lens and in short, it’s a human story that happens to take place at the border. 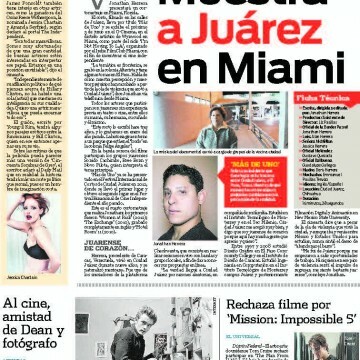 This approach is key and is where most Latino themed films have demonstrated that there’s an thirst and appetite. The film has gone on to screen and bring home some accolades at several film festivals including the Plaza Classic Film Festival and the Binational Film Festival. Q: How did the creative process begin? What was the inspiration? A: I’m originally from Caracas, Venezuela, but after some traveling and moving around I ended up living in Juarez, Mexico for 9 years. 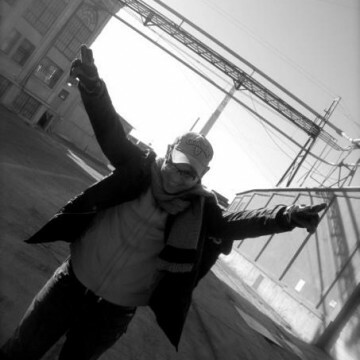 While there, I applied and was granted an international student visa, which was when I began to study film at New Mexico State University; This was back in ’09. I couldn’t really afford moving to the U.S., plus I was already married, which is why I decided to commute from Juarez to El Paso through my 4 years of college. All this coincided with the wave of drug-cartel related violence that took place in Juarez. Q: Anything in particular that was high concept/risky with your film that made you grow as a filmmaker? A: Three times a week my life revolved around U.S. Customs, Ports of Entry, Visa, Discrimination, Profiling, High Gas costs, and more, but I also heard many first-hand stories of people that had been affected by either the cartels (kidnaps, extortion, etc) or by the corruption that derived from all this (cops and military doing the same kidnaps, extortion, etc). Perception of that situation was very different on both sides of the bridge. That was my day to day around the time I started to write this. I don’t think people realize how close the border of El Paso, TX is to Juarez (I could throw a rock and hit someone on the other side), so one day as I was starting my commute to New Mexico from Juarez, I passed by a park that is on the bed of the Rio Grande river, on the Mexican side. There, in front of the 12ft iron fence that was raised to keep mexicans out, was a border patrol SUV. I literally saw the entire film pass in front of my eyes: a border patrol officer watches an act of corruption on the mexican side of the border and does nothing about it. The story slowly developed from that seed into what you saw. The goal became to write a story that showed the stereotypes that had grown from this wave of violence, which in turn created discrimination. If I live in Juarez, am I instantly a drug dealer?, Many people in El Paso were weary and suddenly Juarez was off limit and every average mexican became a suspect. Q: How much did overall production cost? how was money attained? crowdsourcing? A: The budget was tricky. From the get-go I knew I would have to self fund this. 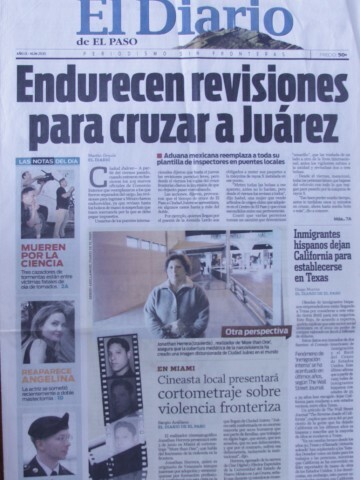 I was planning on shooting in Juarez for more realism, so I wasn’t hoping for too much of a backing from U.S. investors. Q: Was there anything that had to be compromised as a result of the finances that turned out to surprise the crew? How did you overcome any of these barriers? A: For a more successful outcome I recruited the best administrator/producer I know: My wife. If she had managed my freelancing income to pay for our home, bills and college, so making a slot to pay for this short film should be a breeze. She was born and raised in Juarez, so this story hits home, and not only did she take care of the finances, but also got people on board for free. Locations, food, P.A.s, and a power plant for outdoor shooting were loaned for our 3 days of shooting (1 full, 2 short). She was also able to get a free permit to shoot on the mexican side of the Bridge of the Americas and access to the actual location that sparked the story, which was as close as we could get to the Iron Fence. Our budget was spent on wardrobe for the Officers ($80) and dressing her 2001 Chevrolet Cavalier as a cop car ($40). Local bands heard about this film and many were enthusiastic to let me use their music. All the sound design and score was done by Hector Rodriguez, at Rockstar Studios and the post production was done by me, which again, kept my costs very low. Q: Any key casting roles that anchored the film? Any favorite moments? A: “More Than One” is as real as it can get. None of my actors are real actors. I believe Guadalupe Trevizo (Off. Balbuena) had played a tree in elementary school and my mother (Dolores) did some folkloric dancing in high school as well. 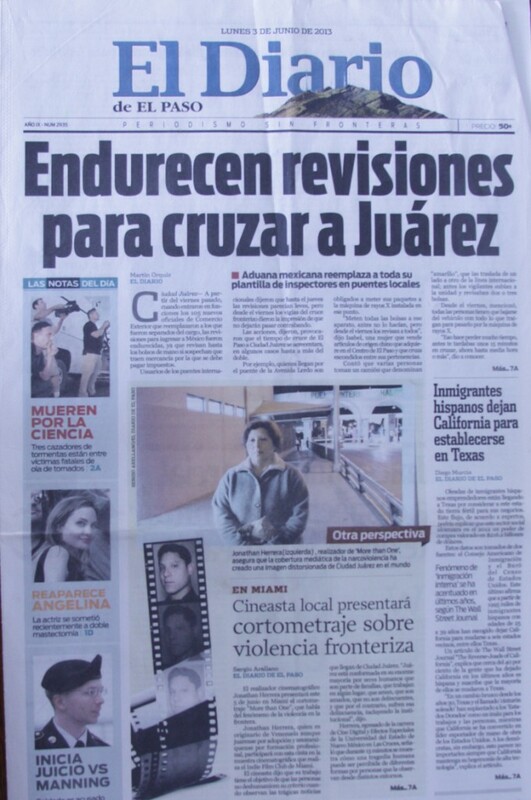 That was the extent of my cast’s acting experience, however, they all lived in Juarez. Everyone was family. Literally. Watch the credits roll and you’ll see a lot of Herrera’s, Gallego’s and Trevizo’s, all either my family directly or my wife’s. You could feel that energy on set. While my actors were not doing anything for the camera, they were holding lights or helping pack. “More Than One” is as real as it can get… None of my actors are real actors… this is not to say that I was lenient about what I wanted. The emotional goals were clear. Now, all of this is not to say that I was lenient about what I wanted. The emotional goals were clear, and even though I had to sometimes enact my instructions to them, I was more than proud with their delivery. There are many moments that are dear to me in the film, but one that really stands out is the ending (which I won’t reveal), when I gave my mother the instruction to “react as if it was me! Look at him [the other actor], and imagine it’s me”. I was so proud of the result, but I later felt bad for making her really cry. To this day that scene chokes me up. Q: Any key festivals during its run and/or licensing deals? What success has it achieved? How has it helped you in your career? A: “More Than One” has opened more doors than I expected. Before I graduated (4 months after it had been shot), it won 2nd Place Student Film at the Binational Film Festival 2013 in El Paso, TX, but since I immediately moved to New York after my graduation, the film had been a bit slow on the distribution side. While in New York, I attended an undisclosed ad on craigslist and had the opportunity (honor) to meet Emily Best from Seed & Spark. After I was at her apartment for said interview, she insisted that I was over qualified for the position but made it a point to really tell me about the changes in the industry and the potential she saw for this film. We both agreed that it had been a learning experience, and although there were opportunities for improvements, it had been enough to show my essence as a writer/director. The advice was to get the film out there!, A facebook page, a trailer, a poster, festivals, festivals and festivals. 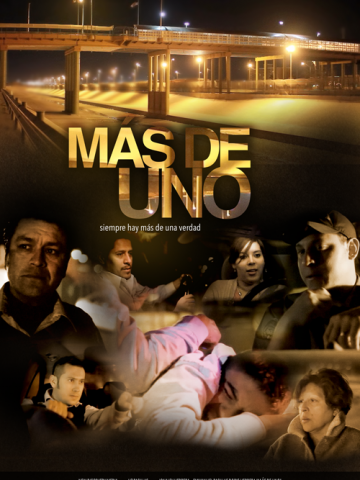 The film went on to earn 1st Place Local Selection at the Festival Internacional de Cortometrajes in Juarez, Mexico, a screening in July’s selection of the I’M NOT GONNA MOVE TO L.A. short film cycle at the O-Cinema in Miami, FL (Indie Film Club Miami) and a screening as part of the local selection for the Plaza Classic Film Festival 2013 in El Paso, TX. Most of these prizes and screening led to a decent amount of press, which I ultimately used to extend my stay in the U.S.
Q: Has the film helped launch careers of any filmmakers? if so, how? Are short films important? And if so, why? A: Aside from myself, nobody was formally involved in the film industry, however, my wife has since formalized her role as a producer and 1st A.D. on personal and freelance projects. I honestly believe in the short film as a true, efficient, and inspiring form of expression. It has its own rules when it comes to narrative, and it values creativity, determination and resourcefulness. I can’t say that it has “launched my career”, but it is definitely helping polish my skills and get me closer to the goal with much more respect for the art in what we do. We hope you enjoyed taking a few licks from this Short Film Sundae. Keep that spoon ready for more, but please rinse thoroughly. For Movienomics.com, a special thanks to Jon Alex Herrera and his crew. You can check out more work from Jon Alex here. Think your short has found its way to the intersection of art & commerce? Tell us why. 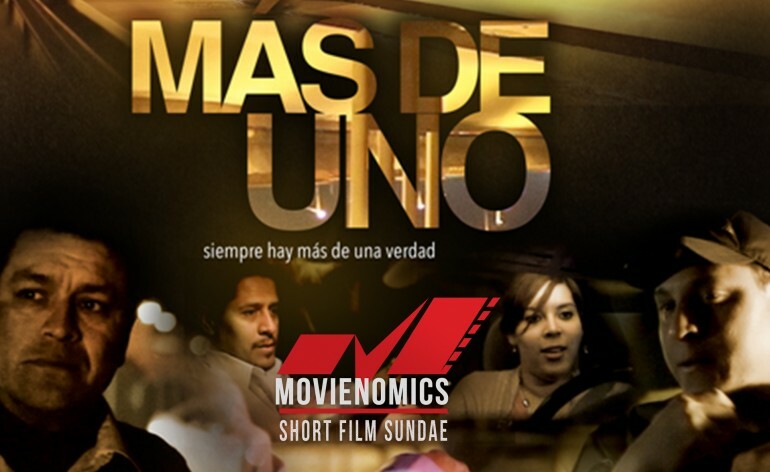 Send us the link or tweet it directly using #movienomicsshorts to @ReelMovienomics.